I'm starting a separate post for this. Check out THIS POST for more info. So I've added my link, so we can keep up commenting on each other's blogs - and hopefully I'll get to know new bloggers! Thanks so much! I added you! I am so happy to have discovered your blog! Yay, I'm so happy that you started this! This is the vegan community I relate to!! So glad you joined! You're wonderful! Great to meet you through MoFo! Looking forward to reading more from you! I am not a vegan, but thoroughly enjoyed trying out Vegan for a month, but I am still alas a Vegetarian and it would be unfair to add my name to the linky above if some vegan readers do not follow non-vegan blog, but A BIG THANK YOU TO YOU and for your lovely comments over the past month. But you are a vegetarian and a vegan mofo participant! I would say SURE!!!! I'd love for you to join! Thanks so much! Neat! Thanks for doing this! I will definitely be a regular visitor to your blog now that I've found you!! Thanks Bianca! I'm LOVING your blog, too! I'll be over again very soon! Great post and thanks for including me. 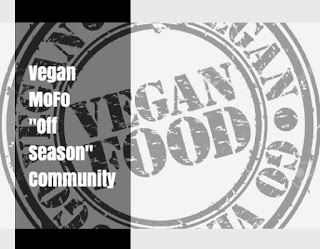 So great connecting the growing vegan community! Community makes it all so much better! Thank you for creating this list, it will be great to connect with our community of MoFoers throughout the year, I have really enjoyed getting to know everyone this past month! I agree! It was such a great year for MoFo! Thanks for joining the Off Season List, too! Such a great idea, it will be lovely to keep in touch with everyone! It's been great getting to know you, and the other people on the list, this MoFo. I'll add you soon! It was great getting to know you as well! Thanks so much! Thank you so much for inviting me to join this! It's a great idea!!! Thanks so much! I hope to have semi-weekly link-ups, too! Thanks so much! I hope to have some things we can all do, too! Stay Tuned! Yay - a way to keep all the fun going! Thanks for setting this up! What a hit this Off Season Vegan Mofo LinkUp is! So many yummy recipes to explore! I'd love to see it grow ever more :) Thanks for all of your help!